For the first month of Ricardo and Felicity’s affair, they greeted one another at every stolen rendezvous with a kiss — a lengthy, ravenous kiss, Ricardo lapping and sucking at Felicity’s mouth as if she were a giant cage-mounted water bottle and he were the world’s thirstiest gerbil. This entry was posted in Popular Culture on June 30, 2010 by Michael Happy. In a book published over twenty years ago, I wrote that literature is not a coherent subject at all unless its elementary principles could be explained to any intelligent nineteen-year-old. Since then, Buckminster Fuller has remarked that unless a first principle can be grasped by a six-year-old, it is not really a first principle, and perhaps his statement is more nearly right than mine. My estimate of the age at which a person can grasp the elementary principles of literature has been steadily going down over the last twenty years. So I am genuinely honored to be able to pay tribute to an educator who has always insisted on the central importance of childrens’ literature. 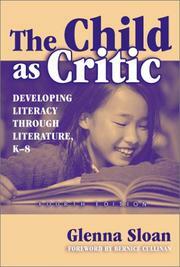 Glenna Sloan’s The Child as Critic is a wonderful expansion of this idea. So it’s appropriate, for this and other reasons, that Frye’s name be given to the new K to 8 school in Moncton. This entry was posted in Current Events on June 30, 2010 by Ed Lemond. VOTE DAILY HERE!! GIVE MONCTION THIS MUCH-DESERVED STATUE!! Just a reminder that the Frye Festival needs your help to win $25,000 to create a bronze life-sized sculpture of Northrop Frye sitting on a park bench reading a book outside the Moncton Public Library. As part of a national competition presented by Pepsi Canada, the Festival has submitted a proposal to win the funds to create an enduring reminder of our community’s most famous son. Vote to Refresh Moncton! Beginning on Thursday, July 1st and running until Tuesday, August 31, 2010, everyone is invited to visit the website www.refresheverything.ca daily and vote for “Feed your imagination” in the Arts and Culture section. The winner will be chosen exclusively on the number of votes it receives, so vote daily and get your friends and family to do the same! This entry was posted in Frye Festival, News on June 30, 2010 by Ed Lemond. This entry was posted in Current Events, Society on June 30, 2010 by Michael Happy. This entry was posted in Current Events on June 30, 2010 by Michael Happy. The Black Bloc on their unimpeded rampage through the financial district. Where are the police? For a week I watched the police search, push, provoke and arrest people, the majority of whom only wanted to express their opposition to what they view as a corrupt and illegitimate organization. How is it possible, with a $1-billion security budget and a 20,000 strong security force, that 75 to 100 Black Bloc anarchists can rampage 24 blocks through the city for 90 minutes without being stopped? What is going on here? Are the police completely incompetent or were the so called ‘Black Bloc’ led or infiltrated by police provocateurs or government agents? Why were police cars abandoned on the street when they could have been moved? Was there a covert operation in play to help justify a massive security bill when it has been made clear by CSIS that there were no credible terrorist threats to the summit? 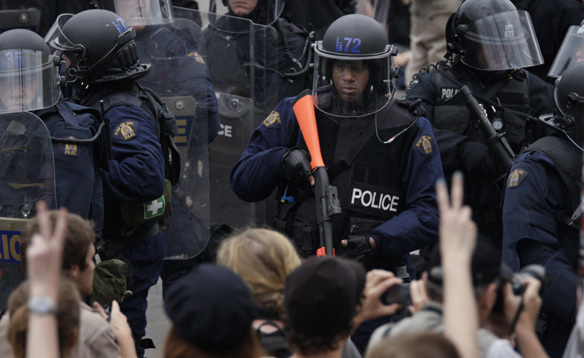 If the Black Bloc were the only credible threat, why were they allowed to run amok? Was Toronto a larger replay of Montebello? 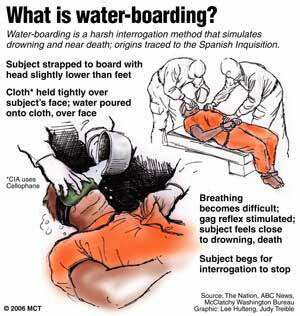 Only a full inquiry with unimpeded access to information regarding police tactics will reveal the truth. 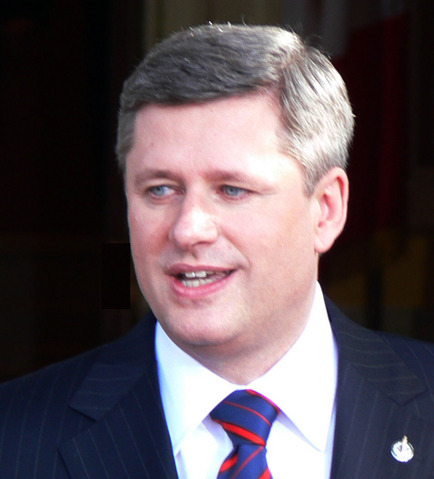 This entry was posted in Canada, Current Events on June 30, 2010 by Michael Happy. As many readers of this blog know, Northrop Frye was the founder of the Centre for Comparative Literature. The Centre recently celebrated its fortieth anniversary, and today, a year later, we are mourning its demise. The University of Toronto has in effect decided that the Centre for Comparative Literature will be closed and the graduate program in Comparative Literature will be suspended, effective the end of the upcoming academic year. 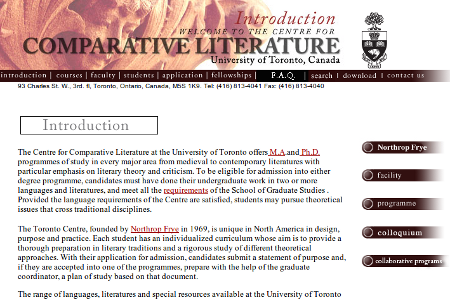 All students in the program will be permitted to finish their Comparative Literature degrees, but this will also mark the end of the road for Comparative Literature at the University of Toronto. The Strategic Planning Committee (SPC) has recommended that the Departments of East Asian Studies, Germanic Languages & Literatures, Italian Studies, Slavic Languages and Literatures and Spanish & Portuguese be incorporated into a proposed School of Languages and Literatures, a new unit designed to strengthen the profile of teaching and research in languages in the Faculty. The SPC has also recommended that the Centre for Comparative Literature be transferred to the proposed School and be redefined as a Collaborative Program. The School will have a single Director and centralized administrative services; individual language groups will retain responsibility for their undergraduate and graduate programs. The specific structure and operating principles of the School will be determined through a process of consultation with academic administrators, faculty members, and other stakeholders in the relevant units. The Dean will appoint an Advisory Committee to complete this process by December 2010. All of our current faculty will be “returned” to their home departments despite the fact that the kind of teaching they do in Comparative Literature may very well not mesh with their home departments. For instance, I think here of Eva-Lynn Jagoe, about whom I blogged earlier this year, who will be returned to Spanish and Portuguese, and then, of course, to the School of Languages and Literatures. 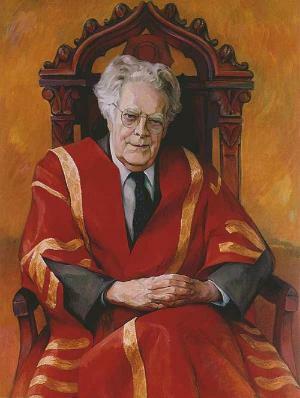 It is a sad day when we witness the demise of Frye’s Centre for Comparative Literature, and yet we see the inspiring success of the Northrop Frye Festival in bringing Frye to the forefront and reminding Canadians (and the world) of just how influential and important Frye was as a public intellectual, writer, and teacher. This entry was posted in Centre for Comparative Literature, News on June 30, 2010 by Jonathan Allan. The critical canon, like the literary one, naturally changes over time. The anthology of criticism I used as a student in the 1960s––The Great Critics, ed. Smith and Parks (3rd ed., 1951)––included a number of critics very seldom read nowadays (e.g., Henry Timrod). The first edition of this anthology (1932) included Marco Girolamo Vida; the second edition (1939), Antonia Sebastian Minturno. The fact that critics come and go is a commonplace observation. Henry Hazlitt’s The Anatomy of Criticism, widely read in the 1930s, has more or less disappeared. Frye’s Anatomy of Criticism has had a much better fate, but the question is frequently raised about Frye’s status today. Has he, like Henry Timrod, disappeared into the dustbin of history? “Who now reads Frye?” asks Terry Eagleton, rhetorically. In an entry in this blog some time back (26 September 2009) Jonathan Allan reported on the contempt for Frye he heard at a Canadian Studies Conference. Allan, however, goes on to surmise that “Frye, in most instances, is now covered in survey courses of literary theory.” I suspect this is the case, though descriptions of such courses are often so brief and lacking in specificity that without a syllabus at hand it is impossible to know what’s on the reading list. Still, there are indications that Frye is still being read. His Fearful Symmetry was among the most frequently borrowed books from the English Faculty Library at Oxford during the Trinity Term 2009 and the Hilary Term 2010, and if we survey what is available on the web, we discover that Frye has not at all disappeared from college and university course descriptions and syllabi. The list that follows records the results of such a survey. My guess is that it represents only a fraction of those courses in which Frye is required or recommended reading or is otherwise the focus of an entire course or of a course unit. (I quit searching after I had recorded 400 entries.) There are doubtless a number of course in twentieth‑century literary criticism, Shakespeare, Blake, Canadian literature, and other subjects where Frye is read, but, again, this information is not always available in the catalogue course descriptions that are available on the web. Bloggers are invited to send me additions to the list (denham@roanoke.edu). This entry was posted in Bob Denham, Frye and Contemporary Scholarship on June 30, 2010 by Bob Denham. On this date in 1905 Albert Einstein published “On the Electrodynamics of Moving Bodies” laying out his special theory of relativity. Interviewer: In 1938 Einstein said that “Physical concepts are free creations of the human mind, and are not, however it may seem, uniquely determined by the external world.” Did Einstein’s recognition of the fictional, or, if you like, mythical status of physical concepts open up a new common ground between the activity of the scientist and the activity of the poet? Frye: Oh, I think so, yes, and I think Einstein knew that. He was really saying that science is mental fiction just as the arts are and that the question of what is really there underneath the construct we put on it is only a kind of working consensus. If a painter looks at railway tracks stretching out to the horizon he will see them meeting at the horizon. But, as Margaret Avison says, “a train doesn’t run pigeon-toed.” You would get on the train if you knew that was really true; so that what is really there is a matter of working consensus. Similarly, you can prove mathematically the atomic construction of protons and neutrons and electrons inside an object like this desk, but as a matter of ordinary social working consensus you keep on bumping into it. . .
Interviewer: In the Anatomy of Criticism you suggest that “criticism” must be understood as an organized body of knowledge about art in the same way that “physics” is understood as an organized body of knowledge about nature. If this understanding of criticism is generally accepted in the intellectual community, will humanists and scientists find themselves in a more fruitful dialogue? Rasky: Is there any easy way of defining God? Frye: You can’t define him at all. It’s not a definable word. This entry was posted in Anniversaries, Video on June 30, 2010 by Michael Happy.